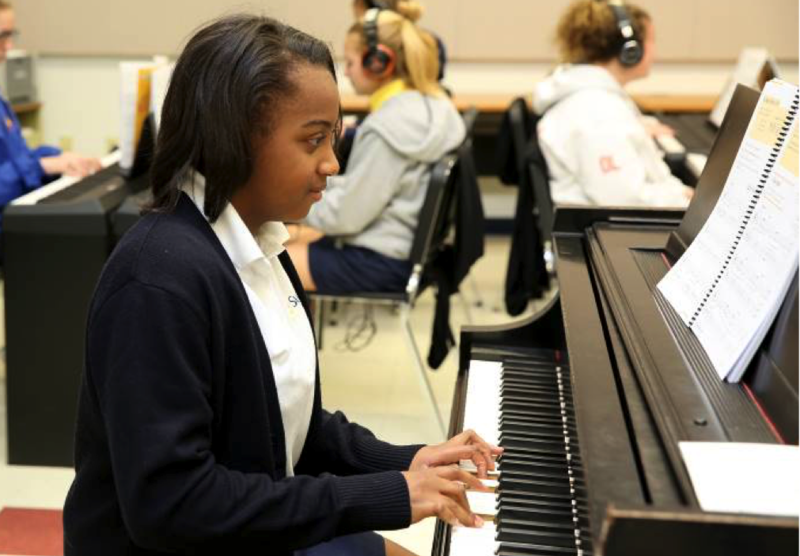 To support the core value to develop the whole person, Saint Ursula Academy offers a rich selection of fine art programs and electives to appeal to the interests of our students. Whether interested in the arts as a hobby or as a future career, students can benefit from four-year programs in Art, Design, Theatre, Vocal Music and Instrumental Music. In addition to classwork, there are numerous performances and events that provide opportunities for students to display their talents and work. 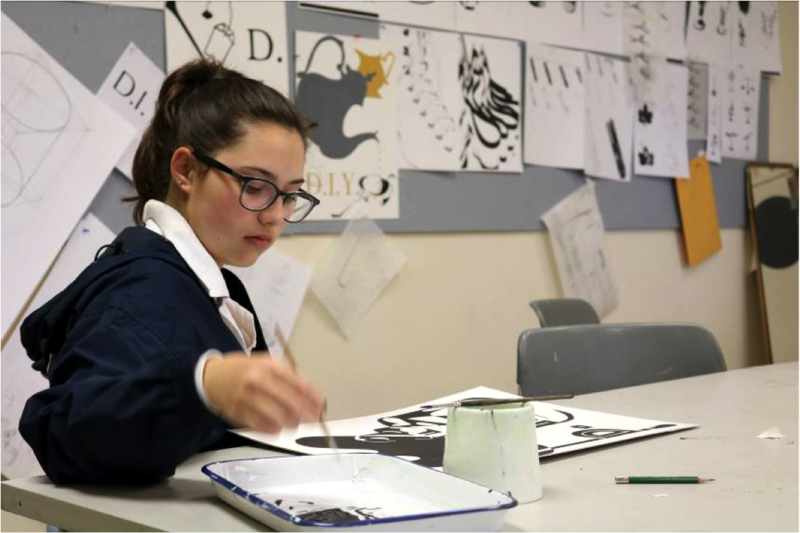 The Art program at Saint Ursula Academy provides the elements and principles required for students to develop perception, dexterity, language and a deeper understanding of creative processes. 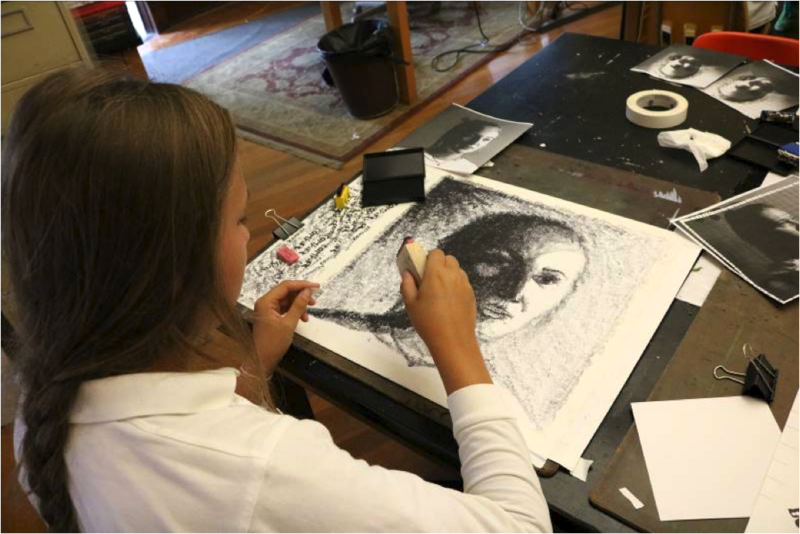 Over four years students are able to participate in studio course exercises exploring freehand drawing from life, 2-dimensional projects, 3-dimensional projects and digital projects. Students are also given the opportunity to develop their AP Studio Art portfolios. As part of the art program at St. Ursula Academy, field trips to our city's fine art museums and cultural centers will be required. This allows students to apply their first-hand experience to the world around them. Art students work in several mediums and have won numerous Gold and Silver Key Awards in the annual Scholastics Art competitions. The four year Design program at SUA provides a true catalyst for learning critical thinking, collaboration, communication and creativity. The sequential classes deepen the students' understanding of both visual literacy and language in carefully structured steps that guide the student from design fundamentals to sophisticated challenges in the senior portfolio class with an emphasis on process. Design students learn the elements and principles of design through discovery and investigation, thorough color theory and application. They work with word and image, illustration, typography, photography, graphics, symbols, marks, letterforms and logos manually as well as on I-Macs equipped with Adobe Illustrator, Photoshop and the In-Design Suite. Design students tackle real world assignments and learn appropriate interpretation and problem solving choices, presentation, budgeting and production techniques as they witness the vital role design plays in our daily lives. Field trips to professional studios, exhibits and industries, as well as the history of design from prehistory to innovative trends prepare the students to study the design major of their choice in college. Many choose to study architecture, urban planning, interior, industrial, fashion design, merchandizing or digital and visual communication in many of the most prestigious schools nationally and internationally, including DAAP (Design, Architecture, Art & Planning) college at the University of Cincinnati, the Pratt Institute in New York, Rhode Island School of Design and the Savannah College of Art and Design. The Saint Ursula Music Department has many ways that students may get involved, whether their love is vocals or instrumentals. Three levels of choral groups provide opportunities for students with varying abilities and interests. The Saint Ursula Academy Vocal Ensemble (SUAVE) performs locally and nationally and has won numerous awards and accolades for their talent. The Saint Ursula Academy Symphony Orchestra (SUASO) performs various times during the school year, often with SUAVE. They also have won many local and international awards. The Natalie Bradley ‘09 Music Technology Center provides equipment for students to create musical in the digital age. 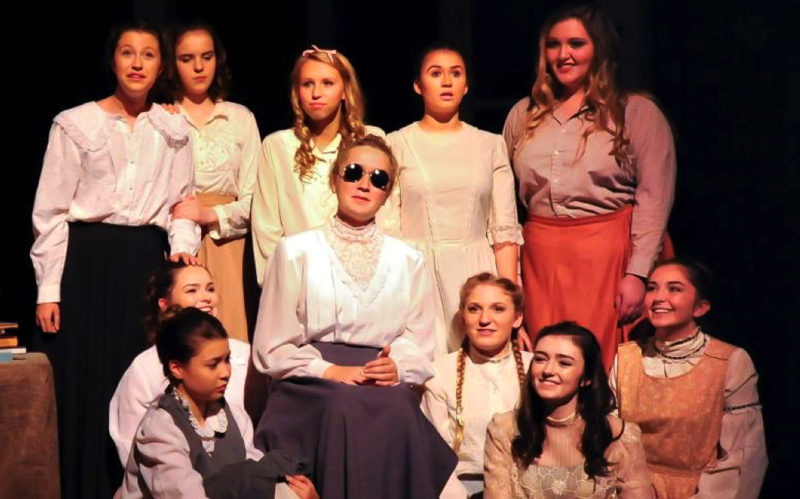 The Saint Ursula Academy Theatre Program is dedicated to helping interested and enthusiastic students acquire theatrical knowledge and experience both in the classroom and with the rehearsal and performance process from multiple perspectives including onstage and backstage. Saint Ursula Academy students can enjoy a full four year curriculum of acting classes during the day, ranging from introduction to acting to technical theatre and directing.